A spectrometer is used to measure the spread of colours in light. This one was made by W. Wilson in London. Light from a source enters the collimator through a narrow slit and is formed into a parallel beam before striking the prism where different wavelengths are deviated by different amounts. The light then leaves the prism and can be observed through the telescope. This spectrometer has an iron tripod stand and a central turntable which can be rotated and adjusted using three spring mounted horizontal screws. The telescope can also rotate around the turntable and the width of the collimator slit can be adjusted. White light is made up of many different wavelengths and each wavelength corresponds to a different color. The prism in the center of the spectrometer has a much higher refractive index than air which means that the light beam will be bent through an angle. In fact, the refractive index depends on the wavelength so that different wavelengths are bent through different angles. The shorter the wavelength, the greater the angle it will refract. This means that the prism separates white light into all its different component colors that can then be observed through the telescope. Knowing what wavelengths of light a source emits can tell the observer a great deal about the chemical nature of the source. Different elements will emit different wavelengths of light. Some elements emit strong bands of a few colours. These bands are called spectral emission lines. When observing light emitted from a specific source the user can rotate the telescope and determine the angle of refraction for each line. They can then use this information to determine the wavelength. The user can then determine the chemical makeup of the source. Examining spectral lines can be used to identify elements in chemistry as well as allowing astrophysicists to determine the chemical makeup of stars by examining their spectral lines. 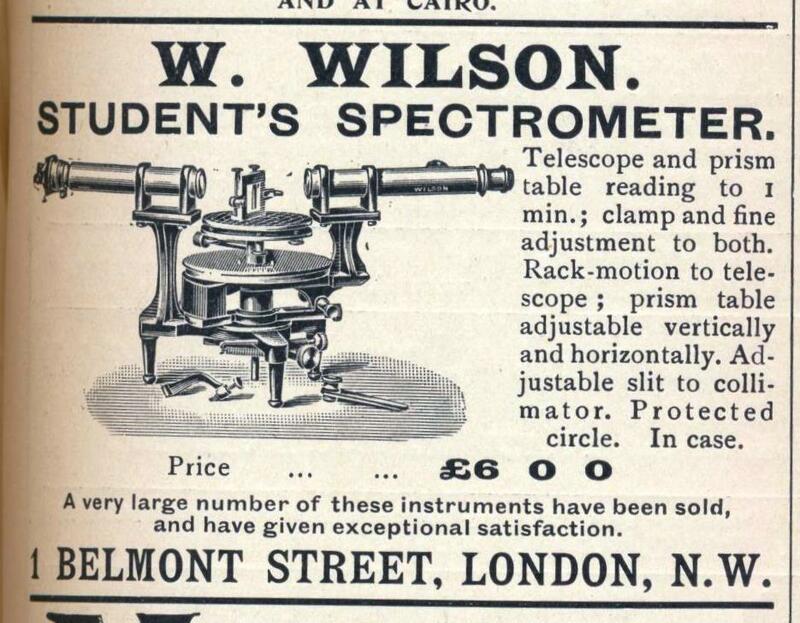 While the ancient romans were familiar with a prism’s ability to split white light into a spectrum, it was not until 1666 that this phenomenon was investigated by Isaac Newton who coined the term ‘spectrum’. The first spectral lines were identified in 1814 by Joseph Fraunhofer in the light coming from the sun and the study of spectral lines began in earnest. 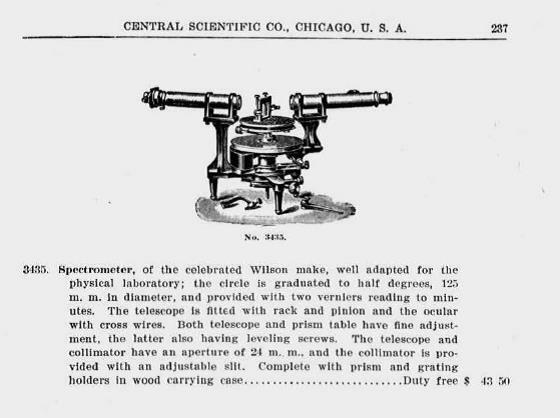 Some information on the maker, William Wilson, can be found the file below.